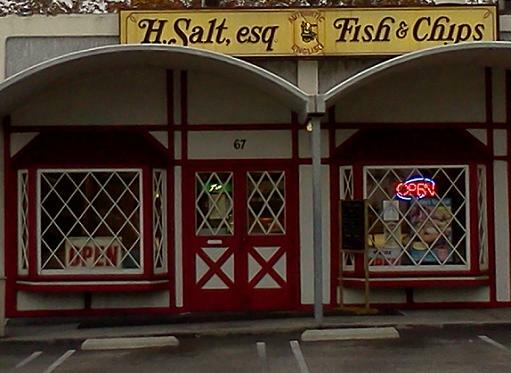 With the demise of Long John Silver’s in Montclair, the only corporate venue for fried fish locally is H. Salt in Upland. (One non-corporate venue is Pomona Fish Market.) I dropped in for dinner this week before a city council meeting. H. Salt is in a strip center by a bike shop and barbershop, near a laser tag center, a 99 Cents Only store and a lot of vacancies. The center is in desperate need of redevelopment. H. Salt is a tiny place, the door only a few paces from the counter. It’s run by an older Taiwanese couple who, like the decor, look to have been there for years. I’d guess the shop has been in place since the 1970s and some of the decor is probably original: English family crests, pink and aqua booths, a faux Tube map with icons for Westminster, Charing Cross and other stops. They have fish, shrimp, scallops, clams, oysters, and chicken strips and wings. 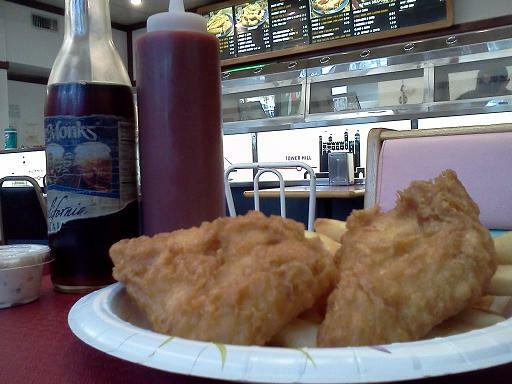 I got the London Special, two pieces of fish with chips ($5.30). They cook to order and the result is about what you’d expect. Actually, it might be a little better: not too greasy, not too fishy. The setting is a bit dumpy, though, and in the shop’s small confines, the near-constant sound of bubbling cooking oil was as loud as a fountain. There was a steady stream of customers, and people on Yelp generally like the place. According to Wikipedia, the chain was launched in 1965 by an English expatriate man named Haddon Salt. There are 27 locations in California. OMG.. the exterior looks dreadful. It is definitely a challenge to get ppl to even walk into the door. The Pomona fish market… I remember eating there a few times and liked it. For some reason, the Pomona fish market got my attention.